As determined by Random.org, the winner of the felted flower bowl is . . .
Congratulations! 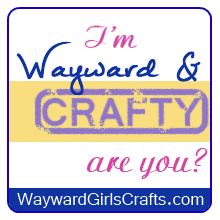 Lani, send your mailing address to waywardgirlscrafts at gmail dot com so I can send you your prize! I'm seriously sad to see this little bowl go—I'm definitely making another. Remember, each entry should be in a separate comment. So if you're following us (thank you! ), you still need to leave a comment on the entry so we can enter you in the drawing! This weekend, we Wayward Girls got to spend some time together! Saturday night, Jaime and I experimented with an Easter-themed project. We've tried this before, but this time, I got to be the resident egg-blowing expert. Egg carton or other secure egg holder. Skewers, preferably metal (the bamboo ones we used tended to shred). Bowl or container for catching egg contents. Rinse the egg and place it securely in one of the wells of the egg carton. Sterilize the pin with the candle lighter. Using the pin, poke a hole in one end of the egg. Turn the egg over and seat in the well again. Poke a hole in the other end. With the pin or the skewer, enlarge the hole until it's between 1/8 and 1/4 inch wide. Poke the pin around inside the egg to break the yolk. Hold the egg, big hole down, over the catching bowl. You can use a straw, but we just used our lips to blow through the top pinhole. Really, really hard. Once the egg is empty, rinse and dry. You must break the yolk! (Break it good!) Poke the pin around in there until you see yolk on it when you pull it out. Then cover both holes with your fingers and give the egg a good shake. Use corsage pins (see picture at right). They're bigger and longer than dressmaker pins, which makes them easier to hold. Carefully chip away at the hole to make it larger. A big hole = easier to clear out the egg. Of course, you'll have to balance appearance with easiness. Be careful! At least one egg got blown up. You can save your egg contents to use again later. Large eggs hold about 1/4 cup of liquid. However, you will get very small bits of ground shell (and possibly larger pieces) in the eggs, so use at your own risk. Good: flowing like liquid. Bad: flowing like . . . egg yolk. The unmixed part of the yolk is a lot harder to get out. And the #1! Take! Home! Lesson! was: DON'T BLOW OUT EGGS BEFORE YOU DYE THEM!! We thought they'd fill with the dye and submerge—but that just wasn't the case. Have you ever blown eggs? What did you find worked best? We haven't had much success before either! It took me about an hour to do eight, so it's still kind of slow.